It’s hard to digest the fact that it’s almost October, especially since it’s still 90 degrees outside every day. But with the end of the year comes the holiday madness. It’s just about time to start prepping for Halloween, and Food Network is ready to go. This Monday, September 24th, the country's top bakers battle it out to create Halloween's spookiest and most irresistible treats. 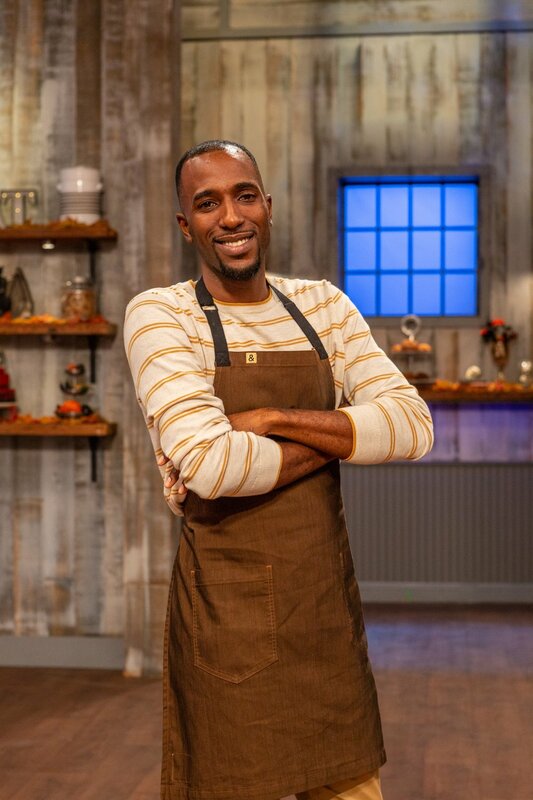 From creepy-crawly desserts to towering confections of terror, these bakers must prove their skills to host John Henson and judges Carla Hall, Lorraine Pascale and Zac Young in order to land the $25,000 prize and the title of Halloween Baking Champion! This season there are two Florida contestants competing to be 2018’s Halloween Baking Champion. Lyndsy is executive pastry chef at a high-end hotel who studied at Johnson and Wales. She loves Halloween because it’s the one holiday she gets to spend with her three kids. Jamal is originally from the Virgin Islands and currently owns a bakery in West Palm Beach, Florida called Ganache Bakery and Cafe. Fun fact: I’ve actually met him and the treats at his bakery are incredible! How did you get your start in the pastry world? Lyndsy: I grew up baking, my mom was a great cook and probably the most tolerant woman in the world because I was always in the kitchen bugging her. We would make hundreds of Christmas cookies, birthday cakes were always homemade and I was constantly setting up bake sales at church. I spent summers in Wisconsin with my aunt and uncle who owned a restaurant and banquet hall attached to their house. My grandfather always owned restaurants, even his retirement job was as a restaurant manager. In short, I grew up in and around the business and restaurants have always been a comfortable place for me. I got into pastry because there is such a great creative element to it and, frankly, raw chicken is just gross! Jamal: I got my start in the pastry world baking with my neighbor’s easy bake oven and at home watching and helping my mom bake cakes and treats every Sunday morning as a child. This is what sparked my love and appreciation for baking. My childhood friend Nicole and I would bake all types of cakes and cookies and sell them around the neighborhood back in St. Croix, USVI. Although I had many passions to make a career out of, baking brought the most joy in my heart. In high school I took a culinary course which inspired me pursue a career in international baking and pastry at the Florida Culinary Institute in West Palm Beach, FL. What's your favorite Halloween creature (witch, ghost, pumpkin, monsters, etc.) or tale? Lyndsy: Two answers here: First, I really want to be a pumpkin carver when I grow up, seriously. Pastry is my first love, but I’m completely obsessed with pumpkin carving and carve as many as I can every year with different tools trying to get better. Second, it doesn’t matter the creature really, but it must be dead (dying or resurrected fine as well) and the gory kind of gross. I live in a world of beautiful pastries and cakes so when I get the chance to make anything gory I don’t hold back. Maggots, oozing, chunky blood spatter…if someone refuses to eat it, I know I did my job. Jamal: I really like mummies and pumpkins! What's your biggest fear going into the competition? Lyndsy: Making a fool of myself on national television, isn’t that everyone’s? That and not finishing on time. So much has to be done in such a short period of time and you have to impress the judges. I tend to over-extend myself, but I’m good with time management so I was hopeful those two things would balance out. Jamal: My biggest fear going into the competition is not making it to the end or making a fool of myself and national TV. Did having cameras watching your every move make it harder to bake? Jamal: Having the cameras watch my every move was a little challenging to bake because there was no room to hide any mistakes I may make. What would you do with the $25k prize money? Lyndsy: I’m a single mom of three…let’s start there…That doesn’t leave much time or finances for travel so I would use it to spend more time with my amazing kiddos and take a few extra vacations. My daughter is determined to see New York City so I promised if I win we will start by taking a mother/daughter trip there. Jamal: If I win the 25k prize money I will use the money to buy new bakery equipment (like a fondant sheeter and mixers), pay off some bills and Relocate my bakery to a bigger space. Don’t forget to tune in to Food Network on Mondays at 9pm to see if one of these talented pastry chefs takes home $25K and the title of Halloween Baking Champion!